The Magic Book 1 Student's Book with activity Book About the course: A six-level American English course for primary school children The primary aim ofthe course is to create a progressive passage whereby the child describes reality using a new tool (the English language) to redefine his surroundings and reorganize the gained knowledge...more..
My Special Book 1 + CD audio + Teacher's Guide insert The worksheet + teacher's guide for the course The Magic Book. Topics: -Social Skills -Road Safety more.. The Magic Book 1 Flashcards - 48 full-colour flashcards with the key vocabulary from each unit of the student's book The Magic Book 1 . Topics: -School things -Colors -Toys -Numbers -Pets -A party by: Mariagrazia Bertarini, Martha Huber, Paolo Iotti 48 full-colour cards 15x21cm, ISBN:...more.. The Magic Book 1 Story Cards - 32 full-colour cards with images and text from the story on the back of each card.. Each unit of the book starts from a story which provides the impetus and the context for the language material proposed. Each teacher can then decide to either have the children listen to the record stories on the CD or to tell the story herself, enlivening it...more.. 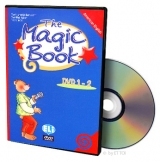 The Magic Book 1 Digital Book CD-ROM is an easy to use interactive CD-ROM, designed for the interactive whiteboard, for use in the language lab or home study. It contains the Student's Book in digital format with interactive exercices, all the recorded listening activities and the video of the animated cartoons. Also available the PDF version of the Activity Book. more.. 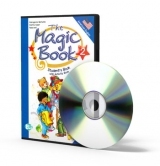 The Magic Book 1-2 DVD The multimedia material of "The Magic Book American English" follows the same approach of the course, which gives special attention to the cognitive-affective development of children. The DVDs provide interactive activities for each unit of the course: in level 1 and 2 new words, relative to the different units are presented, to reinforce and...more.. 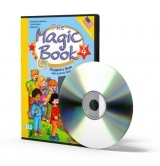 The Magic Book 1-2 Teacher's Book + 4 CD audio The Teacher's Book follows the same pattern and structure of The Magic Book Student's Book to allow the teacher to carry out the activities. Also included are -Recording scripts for the listening exercices -Photocopiable worksheets for rewiew and consolidation -Extra activities -Extra...more..
Children love puppets, and Banjy puppet can be used in a variety of ways. Benjy puppet plays an important role in the lessons. It helps the teacher present and practise the language. It will be a powerful means of communication tool. Benjy can interact with the children and the teacher in their real and fantasy worlds.more.. The Magic Book 2 Student's Book with activity Book About the course: A six-level American English course for primary school children The primary aim ofthe course is to create a progressive passage whereby the child describes reality using a new tool (the English language) to redefine his surroundings and reorganize the gained...more..
My Special Book 2 + CD audio + Teacher's Guide insert The worksheet + teacher's guide for the course The Magic Book. Topics: -Social Skills -Road Safety more.. The Magic Book 2 Flashcards - 48 full-colour flashcards with the key vocabulary from each unit of the student's book The Magic Book 2 . Topics: -Feelings -Classroom -Prepositions -Body -Rooms -Food -Farm animals by: Mariagrazia Bertarini, Martha Huber, Paolo Iotti 48 full-colour cards...more.. The Magic Book 2 Story Cards - 32 full-colour cards with images and text from the story on the back of each card.. Each unit of the book starts from a story which provides the impetus and the context for the language material proposed. Each teacher can then decide to either have the children listen to the record stories on the CD or to tell the story herself, enlivening it...more.. The Magic Book 2 Digital Book CD-ROM is an easy to use interactive CD-ROM, designed for the interactive whiteboard, for use in the language lab or home study. It contains the Student's Book in digital format with interactive exercices, all the recorded listening activities and the video of the animated cartoons. Also available the PDF version of the Activity Book. more.. The Magic Book 3 Student's Book with activity Book About the course: A six-level American English course for primary school children The primary aim ofthe course is to create a progressive passage whereby the child describes reality using a new tool (the English language) to redefine his surroundings and reorganize the gained...more..
My Special Book 3 + CD audio + Teacher's Guide insert The worksheet + teacher's guide for the course The Magic Book. Topics: -Social Skills -Road Safety -Environmental Studies -Food and Nutrition -Health and Safety -Art -Music -Physical...more.. 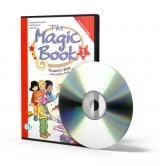 The Magic Book 3 Digital Book CD-ROM is an easy to use interactive CD-ROM, designed for the interactive whiteboard, for use in the language lab or home study. It contains the Student's Book in digital format with interactive exercices, all the recorded listening activities and the video of the animated cartoons. Also available the PDF version of the Activity Book. more.. The Magic Book 4 Student's Book with activity Book About the course: A six-level American English course for primary school children The primary aim ofthe course is to create a progressive passage whereby the child describes reality using a new tool (the English language) to redefine his surroundings and reorganize the gained knowledge thanks to the acquisition...more..
My Special Book 4 + CD audio + Teacher's Guide insert The worksheet + teacher's guide for the course The Magic Book. Topics: -Social Skills -Road Safety -Environmental Studies -Magic Lab -Health and Safety -Food and Nutrition -Art -Musicmore.. The Magic Book 4 Digital Book CD-ROM is an easy to use interactive CD-ROM, designed for the interactive whiteboard, for use in the language lab or home study. It contains the Student's Book in digital format with interactive exercices, all the recorded listening activities and the video of the animated cartoons. Also available the PDF version of the Activity Book. more.. 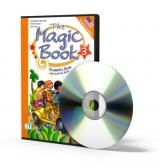 The Magic Book 3-4 Teacher's Book + 4 CD audio The Teacher's Book follows the same pattern and structure of The Magic Book Student's Book to allow the teacher to carry out the activities. Also included are -Recording scripts for the listening exercices -Photocopiable worksheets for rewiew and consolidation -Extra activities -Extra...more..